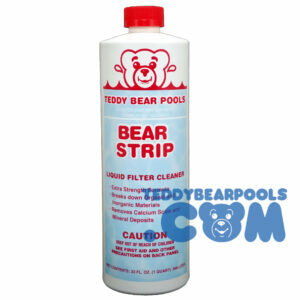 Teddy Bear Pools & Spas offer a variety of filters for your in-ground and above ground pools. Sta­Rite cartridge systems, as well as, Hayward DE & cartridge systems are available for purchase through our retail store. When installing your filter for the first time or at the beginning of each season, we suggest that you remove and clean the DE element or cartridge at least once a week for the first week or two of operation. Your water may look clean, but this will help polish it. At the end of each season, remove the filter top and clean the DE element or cartridge with “Bear Strip,” a biodegradable nontoxic cleaner. Do not use muriatic acid, which is harmful to your DE element or cartridge and the environment. When the reading on the pressure gauge raises more than 10 P.S.I. in 24 hours or the water flow into the pool (return) decreases, it is time to clean your cartridge. It is recommended that you clean your DE filter as needed (about every 4 weeks) or your cartridge at least once during mid-summer months as a maintenance cleaning (Usually at the end of June or beginning of July). Note: pressure gauges are not always accurate.